It’s been nearly four years since the Haiti earthquake and despite the billions of dollars that have been pumped into aid relief projects, the country is still recovering. “Since the earthquake, there has been a lot of short-term aid in Haiti, but creating sustainable and long-term jobs is a different story” explains Rebecca Troxler from 3 Cords, a social enterprise whose workforce includes a number of amputees and members of a local deaf community, who otherwise would likely be unemployed. Back in August, the Haitian finance minister, Wilson Laleau, told a reporter “we need basic jobs for people without skills”, while Georges Sassine, a prominent businessman in the garment industry, said that unskilled factory jobs were “passage obligé” – in other words, a necessary route to better things. A glut of social enterprises, including 3 Cords, seem to disagree with Laleau and Sassine. They are critical of the commitment to low-end jobs and believe that it’s up to socially motivated ventures to develop Haitians’ skills and economic potential. One such enterprise is Industrial Revolution II (IRII), a celebrity-backed venture producing high-end apparel through the creation of jobs that guarantee the minimum wage – a requirement that, according to a report by Better Work, other garment factories in Haiti have previously failed to meet. IRII are committed to providing skills training and donating half of their profits to community and social causes as part of their long-term plan to bring sustainability to the country’s industry. Like IRII, Peanuts4Peanuts (P4P) are supporting high-skilled jobs too, but in peanut-butter factories. They have recently raised over $16,000 through crowdfunding and their plan is that for every jar of peanut butter they produce and sell in the USA, a portion of the profits will go towards supporting children in Haiti. Kendra Wilkins, one half of P4P, who like her co-founder Lizzie Faust has a background in economics, rubbishes any claim that social enterprises operating in Haiti are more interested in self-promotion than altruism. She’s keen to stress that social enterprises can play an active role in bridging the gap between what is currently happening in the country and the public’s lack of knowledge of what more could be done to improve the situation. It’s not just jobs that social enterprises are hoping to create either; it’s a better education system. This in turn could help more Haitians access economic opportunities in the first place. Camara, an Irish social enterprise, are aiming to do their part to improve education through developing learning skills and digital literacy and by supplying thousands of discarded computers to Haiti. Social enterprises may not solve Haiti’s problems on their own, but what they do seem to offer is transparency and a strong business case for building a sustainable future. 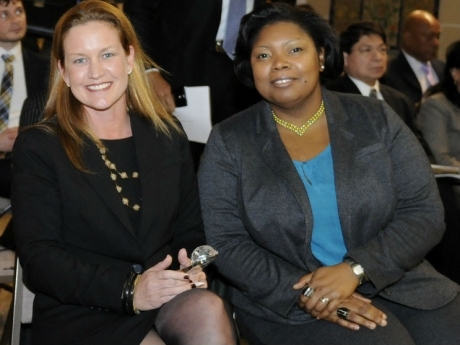 Digicel Haiti Foundation’s Sophia Stransky, CEO (left), and Rachel Pierre Champagne, Head of Projects (right). Telecommunications provider Digicel was two nights ago named a winner at the 2012/13 Corporate Citizens of the Americas (CCA) awards at a gala in Washington DC. The CCA award is an initiative of The Trust for the Americas, with support from the Organisation of American States (OAS), the Inter-American Development Bank and AES Corporation. Digicel was named winner in the ‘Vulnerable Communities’ category for its Digicel Foundation education programme in Haiti, the telecoms company said in a release. It added that the Haiti programme is on track to build 150 schools by 2014 and deliver training to more than 600 teachers, each of whom received more than 450 hours of training, mentorship and professional development. Other winners were IBM Latin America for its ‘Corporate Service Corps’ programme in the economic opportunities category, and CEMEX for its ‘Comprehensive Assisted Auto Construction’ programme in the citizen security category. The Trust for the Americas is a non-profit organisation affiliated with the OAS. It was established in 1997 to promote public and private sector participation in social and economic development projects in Latin America and the Caribbean, Digicel said. Its initiatives, implemented through local partner organisations, seek to improve access to economic opportunities for vulnerable communities in the hemisphere. To this end, The Trust also promotes social inclusion and good governance. SANTO DOMINGO, Dominican Republic – Thousands of Dominican Republic residents have been thrown into limbo by a ruling from the country’s highest court that strips citizenship from anyone born to migrants who entered illegally. The decree affects mainly people of Haitian descent and is likely to worsen already acrimonious relations with neighboring Haiti. Advocacy groups for immigrants expressed anger over the ruling, saying it ignored the rights of those affected and was based on bigotry against predominantly black Haitians. David Abraham, a law professor at the University of Miami, said the decision was part of a larger effort to keep Haitians from entering the Dominican Republic and to encourage self-deportation of those already here. He cited the racial differences between the predominantly black Haitians and mixed-race Dominicans as well as Haiti’s plight as one of the world’s poorest countries. “The fear of the Dominican Republic, of being pulled down to the level of Haiti economically and the ‘blackening’ of the country, has been an obsession of Dominican politicians for well over a century,” he said. Spanish-speaking Dominicans and Creole-speaking Haitians share the Caribbean island of Hispaniola and have a long history of troubles, including wars and massacres. Relations warmed after Haiti’s devastating 2010 earthquake that killed an estimated 300,000 people, but tensions have since resumed. 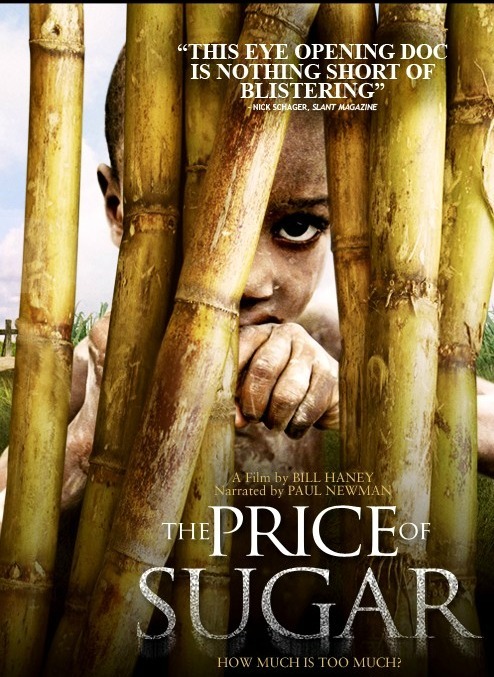 The office of Haitian Prime Minister Laurent Lamothe declined to comment about the ruling. Edwin Paraison, a former Haitian Cabinet minister who has been working to improve relations between the two nations, criticized the court and warned that the ruling could hurt Dominicans. “The sentence expresses a rejection of the Haitian diaspora while setting a dangerous precedent that can be reproduced, if appropriate action isn’t taken, against other immigrant communities, including Dominicans, in several countries worldwide,” he said in an email. The Economy Ministry recently calculated that about 500,000 people born in Haiti now live in the Dominican Republic, but it gave no estimate for the number of people of Haitian descent living in the country. The Dominican Republic’s total population is a little over 10 million. 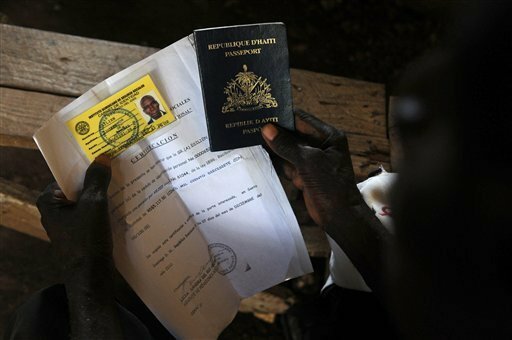 The debate over citizenship began to escalate in 2007, when electoral authorities refused to issue identity documents or return copies of them to Dominican-born people of Haitian descent. In 2008, several people challenged those decisions in court, including Belique, whose birth certificate was seized by government officials when she tried to enroll in a local university. Until 2010, the Dominican Republic followed the principle of automatically bestowing citizenship to anyone born on its soil. But that year, thegovernment approved a new constitution stating that citizenship will be granted only to those born on its soil to at least one parent of Dominican blood or whose foreign parents are legal residents. Citing that constitution, the court ruled that all Haitian migrants who came to work in Dominican sugarcane fields after 1929 were “in transit,” and thus their children were not automatically entitled to citizenship just because they were born here. Dominican lawyer Cristobal Rodriguez said the court disregarded the principle of law retroactivity by applying the criteria of a new constitution approved in 2010 to people born decades earlier. Rights groups and migrant activists said the decision would force many people underground and deprive them of basic needs and public services. Activists said they would likely seek help from the Inter-American Commission on Human Rights, which in turn might submit the case to the Inter-American Court of Human Rights. Jorge Duany, an anthropology professor at Florida International University who has studied the migration of Dominicans in the Caribbean, said the decision comes after countless years of friction between the two countries. 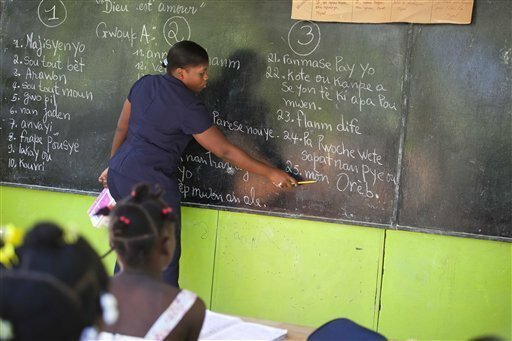 PORT-AU-PRINCE, Haiti (AP) — A senior U.S. official visiting Haiti called Tuesday for greater transparency to improve the quality of education in the Caribbean country’s long-struggling classrooms. 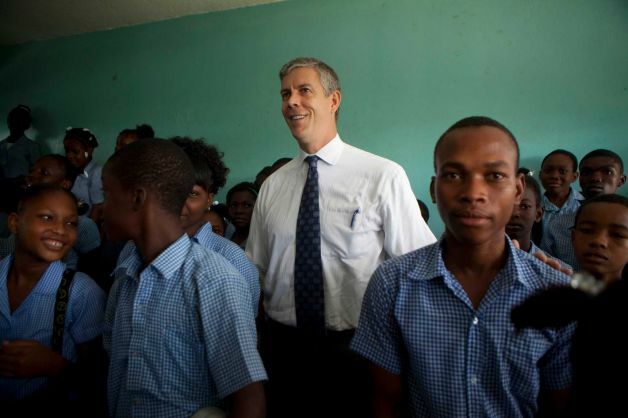 In an interview with The Associated Press, U.S. Education Secretary Arne Duncan said he believes that easier access to information can help improve education standards in Haiti by letting people know more about student and teacher enrollment and by letting them track student progress. These data networks would also help educators know how many college graduates are staying in Haiti, which has one of the highest rates of brain drain the world, Duncan said. Haitian President Michel Martelly, with whom Duncan met Monday, promised as a candidate to make education free and mandatory. He says a school tuition program financed by wire transfers and international phone calls has put 1.3 million children in school, though there’s been no independent verification to confirm the numbers. On his two-day trip, Duncan visited a school where the children sleep on the streets at night. He also saw a seventh-grade class with more than a hundred students. “Far from ideal conditions,” said Duncan, who came to Haiti at the invitation of Haiti’s education minister, Vanneur Pierre. Duncan’s visit came as the U.S. Agency for International Development announced a $15 million grant to improve literacy rates in Haiti. Most schools in Haiti are in deplorable conditions and attrition rates are high. 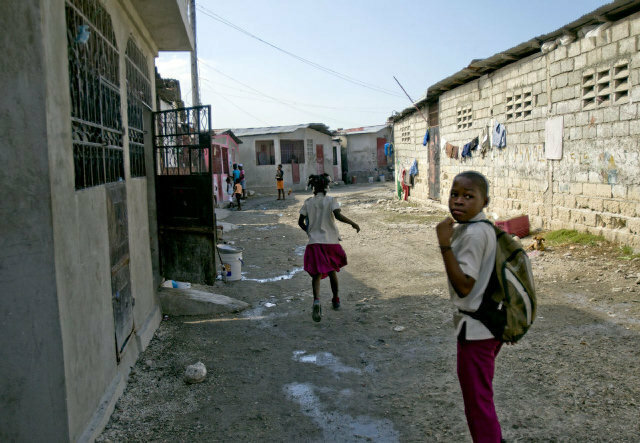 Only about a half of Haiti’s children are able to attend primary school, and less than a fourth make it to secondary school, according to the U.N. children agency UNICEF. L’antagonisme qui oppose la République Dominicaine à Haïti n’a jamais pu briser les liens d’ascendance qui se sont inscrits dans les annales de l’histoire de ces deux presqu’iles. Ils sont sous-estimés d’abord par les historiens dominicains qui prêtent souvent un serment d’allégeance à l’anti-haïtianisme, une vielle doctrine indépendantiste reconduite et nourrie par les gouvernements rancuniers de Pedro Santana, Ulysse Heureaux, Raphael Trujillo, Joaquin Balaguer et même par le gauchiste pollué Leonel Fernandez. Ces historiens de la partie de l’Est se veulent plutôt un nom dans la diabolisation de la présence haïtienne en territoire voisin, décrivant le journalier haïtien comme un sous-homme. Dans ce rang de stylos partiaux, on retrouve les Frank Moya Pons, Roberto Cassá, Bernardo Pichardo et Bernardo Vega, pour en citer un iota. À l’opposé, certains historiens haïtiens, gonflés d’orgueils et peut-être par souci de grandeur ou par ignorance, se sont gardés d’écrire cette belle page d’histoire. Ces écrivains haïtiens retracent uniquement les accrochages transfrontaliers comme la Campagne de l’Est, le massacre odieux d’octobre 1937 et les litiges sur les clôtures mitoyennes des deux républiques. En effet, seule la face obscure de l’histoire de l’Ile soit connue. Ce sont les idéaux destructeurs qui ont survécu les ans. Alors que rien au monde ne peut venir à bout de cette vérité historique : quatre présidents dominicains sont d’origine haïtienne. PORT-AU-PRINCE, Haiti (AP) — Former Haitian President Jean-Bertrand Aristide made a rare public appearance last Wednesday and thousands of supporters shadowed the ex-leader’s motorcade following a court hearing. 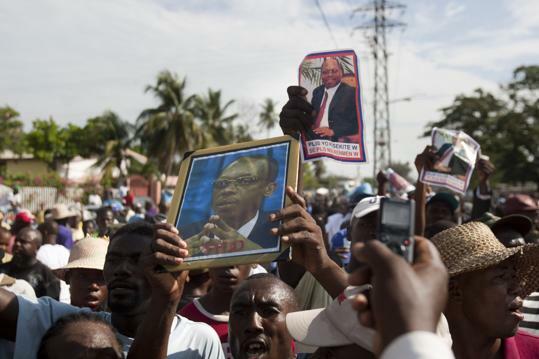 The swelling crowd of backers who chanted songs and waved posters of Aristide in Haiti’s capital pointed to the level of influence the two-time president still holds among the poor more than two years after his sudden return from exile. It also underscored the strong possibility that his political party could prove a serious contender in legislative elections that are supposed to be held before year’s end. ‘‘For the people, the wasps have been knocked out of the nest,’’ said Jean Altidor, a 39-year-old motorcycle driver who had a portrait of Aristide taped to his bike. In his metaphor, Aristide is the nest, and the people are the wasps. With a delegation of longtime allies and former lawmakers at his side, Aristide showed up at a courthouse last Wednesday morning in downtown Port-au-Prince to testify before a judge investigating the slaying of one of the Caribbean country’s most prominent journalists, Jean Dominique. The hearing was closed to the public. Aristide left the crowded courthouse through a back exit three hours later. In an apparent ploy to distract journalists and make it easier for the former president to leave, news media were told to assemble in a nearby room for a news conference with Aristide, which was never held. Aristide’s lawyer, Mario Joseph, said he couldn’t disclose details of discussions about the case. ‘‘What’s important is that President Jean-Bertrand Aristide came and answered questions,’’ he said. Aristide was between terms as president when Dominique, a close friend, was gunned down in April 2000 in the courtyard of the radio station that he ran with his wife. A security guard was also killed. Several people were arrested in connection with the slaying of the outspoken radio personality, but authorities have never pointed to possible architects of the killing. PORT-AU-PRINCE — For years, the low-lying slum along the bay and the AIDS clinic across the street lived in separate worlds, a one-way relationship where the sick shuffled out but healthcare providers didn’t dare go in. 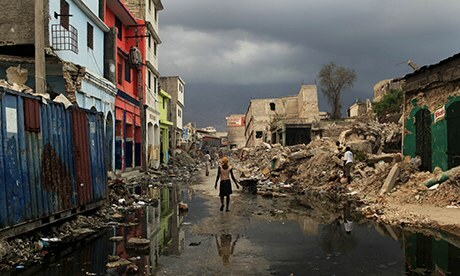 Then Haiti’s massive Jan. 12, 2010 earthquake and subsequent cholera outbreak crumbled the barriers. For all the devastation and death both catastrophes unleashed, they also stirred hope of a healthcare turnaround for the most destitute of Haiti’s poor. For the past year, a small army of community healthcare workers has quietly ventured beyond the clinic’s front gate to confront some of the stumbling blocks that have long made providing quality healthcare in the developing world challenging. On any given day inside Port-au-Prince’s slum-by-the-bay, T-shirt clad health workers and physicians can be seen handing out buckets of chlorinated water and other cholera treatment, supervising community clean-ups and stepping into humble homes to deliver primary care. The intense focus on Haiti’s slums come as an increasing number of Haitians leave tent cities for crowded ghettos, triggering fears of a deepening public health catastrophe in a country where people already contract tuberculosis at a higher rate than anywhere in the hemisphere — except for Peru — and many children never make it to their third birthday because of any number of illnesses, including 21 waterborne diseases. It also comes in a country with one of the hemisphere’s highest rates of HIV, the genesis for the founding of GHESKIO, the Haitian Group for the Study of Kaposi’s Sarcoma and Opportunistic Infections. But the current mission has little to do with AIDS treatment. Rather, the focus is on improving the lives of the poor in a nation where clean water and sanitation are luxuries, and where the government is struggling to raise $2.2 billion to eradicate a cholera epidemic that has claimed 8,048 lives and sickened 650,218, according to Haiti’s Health Ministry. CROIX-DES-BOUQUETS, Haiti (AP) — Teenagers in blue-and-white uniforms pour out of classrooms of this boarding school at the edge of Haiti’s capital, chattering in their native language of Creole about the science test they have just taken. The students don’t speak much French at the school, although it remains the primary language of instruction in most Haitian classrooms. In fact, less than 10 percent of the country’s 10 million people speak French fluently, and in most schools, even the teachers don’t understand it very well although they’re asked to teach in it. The private Louverture Cleary School abides by the Haitian government’s curriculum guidelines but unlike many schools in Haiti it gives equal treatment to French and Creole. The school also introduces students to Spanish from other parts of the Caribbean and the English they will likely need in the future. 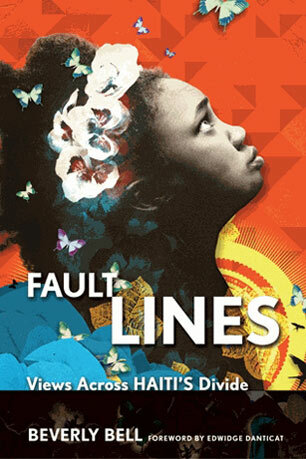 Three years after a devastating earthquake killed more than 200,000 people here, Haiti’s abysmal educational system remains an obstacle to building the expertise and skills needed to help this impoverished country recover. Haiti’s 1805 Constitution declared that tuition would be free and attendance compulsory for primary students. But the quality of education lagged through the years, and plunged during the 29-year-long dynasty of Francois “Papa Doc” Duvalier and his son Jean-Claude, or “Baby Doc,” which ended in 1986. Haiti’s professionals fled into exile to escape political repression, spawning a major brain drain the country has never bounced back from.